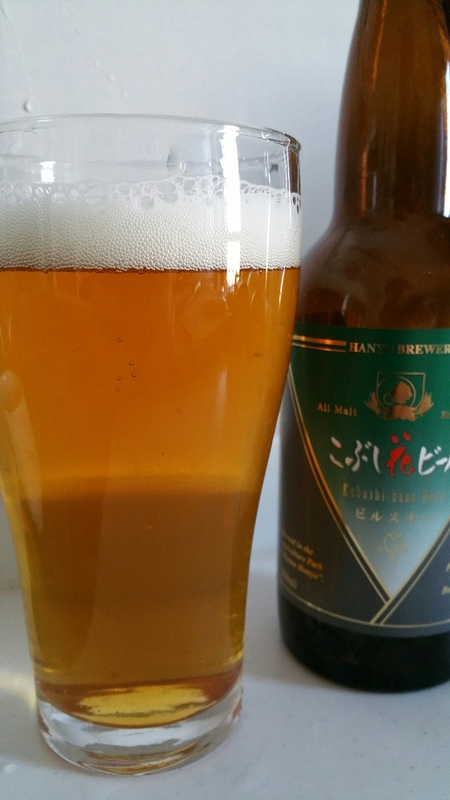 Kobushi Hana Bohemian Style Golden Lager is a 5% Czech style pilsner from Hanyu Brewery, based in Saitama. It’s part of the all-year round line up from Hanyu Brewery. Besides being advertised as the “most popular style of beer in Japan”, it can be found readily available in bottled from online and on occasion, on draft form as well. Looking very much like a pilsner. When I first read the label, I initially thought that Kobushi Hana Bohemian Style Golden Lager was going to be a golden / blonde-esque pilsner lager, what with the descriptive buzzwords being thrown around for either promotional or advertising purposes. After much searching online, well actually looking at the Hanyu Brewery listing page, it was reassuring to know that this was in fact a Czech pilsner and not a mish-mash of styles. It poured out a bright golden colour with a light, frothy white head that clung to the side of the glass as the beer went down, leaving thin white streaks as it did. Kobushi Hana Bohemian Style Golden Lager had a faint grassy aroma with a mild sweetness to it that smelt a bit like warm bread. Quite nicely balanced really. When drinking Kobushi Hana Bohemian Style Golden Lager cold, it had a nice crisp bite to it that was slightly bitter though nothing that will screw your face up too much. The texture was a tad watery for my liking but the malts and hops did bring a little bit of sweetness to it as well as the grassy taste in the body. However, the fruitness became dominating once the beer had warmed up, dominating over the other flavours in the aftertaste. Kobushi Hana Bohemian Style Golden Lager is quite a sweet pilsner when warmed up but nice when it’s chilled. Not the best example but perfectly drinkable.